It’s nice to look back on a forecast we put out Sunday, and note that 72 hours later little has changed in our thinking regarding our upcoming sharp, albeit short-lived, cold shot. Forecast confidence has gone up now that the GFS has finally (multiple days later) come into good alignment with the ECMWF and GEM models that were the basis of the ideas we put out in Sunday’s “State of the Atmosphere.” What we do have now, however, is a better idea of timing and also a more nuanced view of possible impacts. Since there’s a lot to talk about, let’s jump right in. 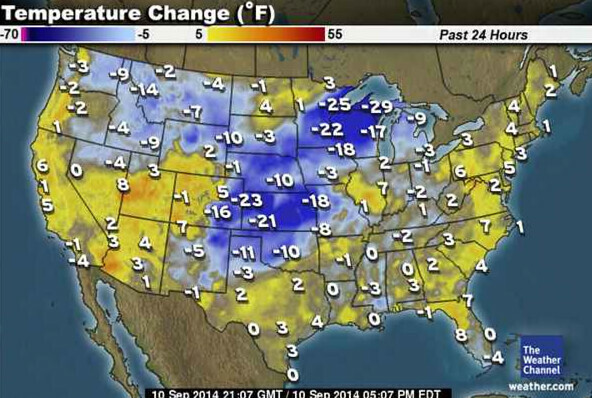 As of press time our Canadian cold front is stretched across Montana, northern Wyoming, South Dakota. It is slowly but surely pressing southward. While today’s highs were well into the 70s, that’s still below normal for this time of year, though it’s much warmer than most of us will be either Thursday or Friday. 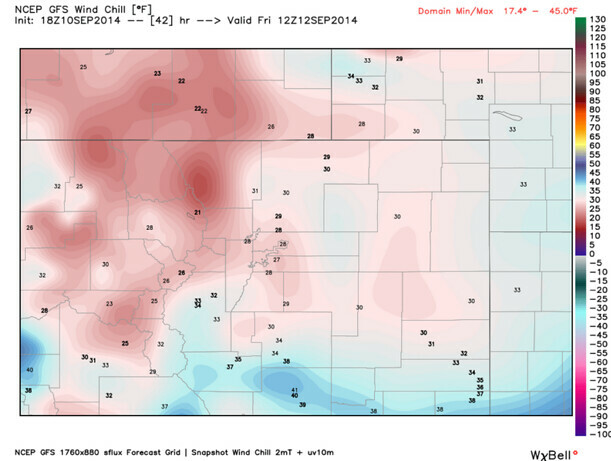 I say most, because the timing of the initial push of cold air Thursday is a little uncertain; since the front is pressing southward, northern areas of the Denver metro area will see the coolest highs on Thursday (probably the 50s to low 60s), whereas areas further south may hit the mid-60s, or perhaps even 70°, before the front starts rolling through. At any rate, expect mostly sunny skies to start our Thursday, with temperatures in the upper 40s in most spots. As the day wears on you’ll notice a steady increase in cloud cover, as well as the possibility of scattered thundershowers developing by mid-to-late afternoon. (The best chance for thunderstorms will be be over the east-central and southeast Plains, where a couple storms might briefly reach severe criteria.) In addition, winds will shift from out of the southwest to the northeast, with breezy conditions, especially by early evening. Gusts of 25-30mph may be commonplace as the front rolls through, with a few spots possibly even seeing gusts to 40mph. Our best guess on timing is that front will move through midday for northern Colorado and reach Denver and points south Thursday afternoon and evening; (keep your eye on Twitter for updates.) During this time, temperatures will begin to drop steadily. Though many spots may still be in the 50s by evening rush, by mid-evening, temperatures will be falling through the 40s into the 30s by midnight. The key period we’re focusing on in terms of possible tangible impacts for Denver metro is after midnight Thursday into the early morning hours Friday. During this time, an upslope flow will develop behind the front, ushering in continued VERY cold air from the north, and supporting scattered showers that may transition from rain to wet snow by dawn Friday. 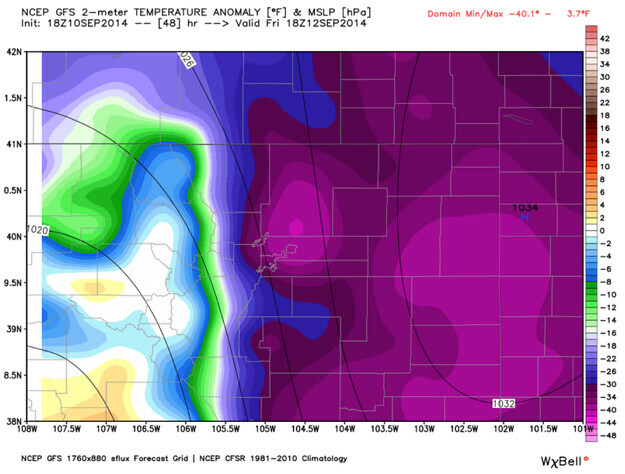 Models are clustered in the 32-36° range for lows across Denver metro by Friday morning, so frost might be an issue in some locales, though cloud cover may limit impacts. Note that by late evening Thursday into Friday morning, northeast winds of 15-25mph will be commonplace, with occasional higher gusts; this will produce calendar-challenging wind chills in the mid-to-upper 20s during sustained winds, with values potentially even cooler than that during gusts. Bundle up! As most of you want to know about the “S” word, I’ll reiterate that our thoughts on that haven’t changed much from a few days ago either. As mentioned above, as temperatures drop into the mid-30s by the overnight period Thursday into Friday, scattered showers may mix with or change to wet snow by dawn. Pockets of drizzle, or potentially even isolated pockets of freezing drizzle, may also appear in spots. Snow is not a sure bet for Denver, though we feel fairly confident some folks in the Denver metro area will be reporting flurries and wet snow showers by early Friday morning. 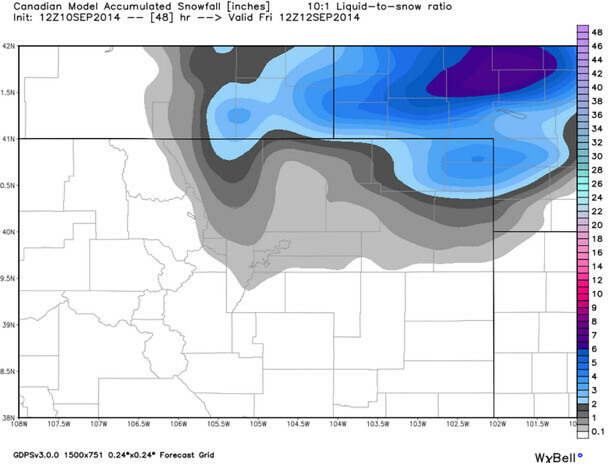 We agree with what NWS Boulder put in their most recent forecast discussion: “If snow does fall in the [Denver] metro area, accumulations will likely be very light and melt quickly.” If you live over 6,000-6,500ft, you probably have the best chance at seeing flakes. Those hoping for accumulating snow versus conversational flakes may have to wait a few more weeks...or possibly longer. By Friday evening winds will have diminished considerably, and we may even see some partial clearing. Temperatures will drop to the mid-to-upper 30s across most spots by early Saturday morning, and these slightly warmer values than Friday morning mean most places will escape frost this time around. As we indicated in the weekend’s “State of the Atmosphere,” because of the overall pattern aloft, the cold we see late Thursday into Friday will be very transient in nature. That means that with partly to mostly sunny skies, temperatures on Saturday could rebound well into the 70s! Overnight lows Saturday night will drop to near-normal seasonal levels -- around 50° for most folks. Sunday looks like a true winner of a day, with mostly sunny skies and temperatures in the mid-to-upper 70s. We would not be surprised if some spots hit 80°! The outlook for early next week is for temperatures staying at slightly below-normal levels for this time of the year, with highs mostly in the mid-to-upper 70s, and overnight lows primarily in the 50s.